Last year the so-called enfant terrible of the Sydney art scene Adam Cullen got busted for drink driving on the Hume Highway. Police also discovered a stash of unlicensed firearms in the boot of his car. You and I could get 14 years in the can for this offence, but Cullen got off with a suspended sentence because some people think he's collectible, he has bipolar disorder, and he was using the weapons to make 'art'! The magistrate tells Cullen to develop "mental hardness". Cullen's motto is "Endurance is more important than the truth." Your correspondent sees red...and immediately thinks of El hombre invisible. 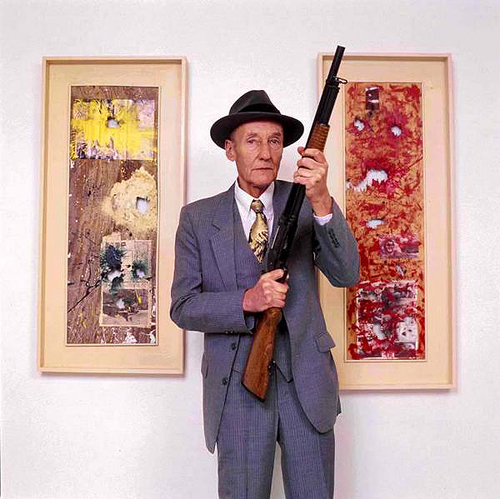 William S Burroughs: "That's an interesting little juxtaposition"
William S Burroughs wasn't the first artist to use guns in art. He recalls conversations with Marcel Duchamp in which Duchamp had shot at paintings but missed because "he was a very poor shot." Surrealist Joseph Cornell had constructed a work in 1943 using a bullet holed piece of glass. Italian Alberto Burri had shot paint cans in front of canvasses in the Fifties, and Yves Klein and Niki de Saint Phalle had done variations of this into the Sixties. And the list could go on...but none of these artists have realised the form as much as Burroughs did from 1982-88. 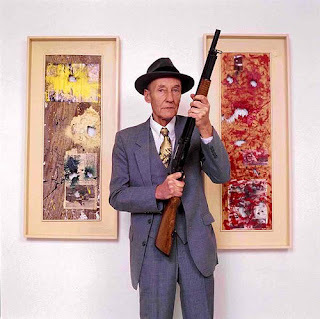 Burroughs says "I want my painting to literally walk off the god damned canvas, to become a creature and a very dangerous creature." In firing a gun at a picture Burroughs is not just exploring a technique but holding a mirror up to society. Even now his art and writings still present us with a frightening view of our future if we allow ourselves to be controlled by conservative attitudes and institutions. Burroughs is mentally hardened. He is a twentieth century giant who has incessantly fought for the liberation of creative thinking and processes, as well as mankind. He is a genius. Burroughs will endure, and remain truthful to himself and his audience. Cullen will not. Final score: Adam Cullen 0 - William S Burroughs 10.